Fall is finally here! Along with Fall comes cooler temperatures, family gatherings and the holidays. Every season I like to stock up on my baking essentials and that includes Pure Vanilla Extract from Nielsen-Massey. If you have never used their Pure Vanilla Extract...I highly recommend it along with all of the pure extracts that they have to offer. Pure Vanilla Extract is something I use a lot of! Almost every day...I am making something that utilizes that ingredient and I ONLY use the best in my recipes. Their vanilla extract can be used in various bread, cookies, cake, cupcakes, pies, tarts and beverage recipes. For example, check out their recipe for Gourmet Peppermint Hot Cocoa below. It makes 6 servings. In a medium saucepan, combine cocoa powder, sugar and salt. Place over medium-low heat and gradually whisk in milk and half-and-half until combined. Stirring occasionally, heat to desired temperature, being careful not to let the mixture boil. Stir in pure vanilla, peppermint and chocolate extracts. Before serving, top with a Vanilla Bean Marshmallow. For an extra blast of peppermint, drop a peppermint candy in the bottom of each mug before serving. Just recently I decided to whip up some pumpkin bread and I used the Pure Vanilla Extract from Nielsen-Massey in my recipe. This vanilla is a pure vanilla extract and I find that a little bit goes a long way. It's not that imitation garbage you find in various retail stores. Nope...this stuff is pure and absolutely delicious! Once my pumpkin bread had cooled...I used the Pure Vanilla Extract to whip up a delicious vanilla glaze and drizzled that over-the-top. Oh my gosh...delicious! If you use the imitation vanilla or the stuff you find at your local "buck store"....trust me, it doesn't even COMPARE with the quality and taste of the vanilla extracts from Nielsen-Massey. Here are a few ideas for the upcoming holiday season. 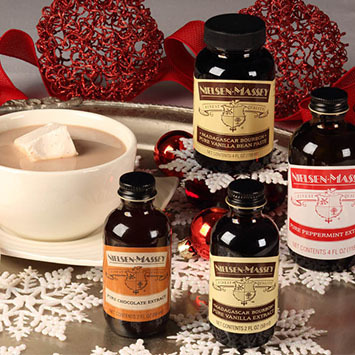 * Give a DIY hot cocoa kit to a friend or loved one. Write your recipe on festive cardstock, stack cocoa powder, sugar and salt in a jar and pack in a basket with Nielsen-Massey Vanilla, Chocolate and Peppermint Extracts. * Instead of using traditional toppings like marshmallows, try crumbled cookies, raspberries or a cherry on top of a steaming cup of hot cocoa. Stir in a cinnamon stick for an irresistible blend of sugar and spice. * Invite friends and family over for a casual hot chocolate bar party. Set out mismatched mugs of various sizes, along with several types of hot cocoa, toppings and whipped cream. Use peppermint sticks for stirrers and have guests vote for their favorite concoction. You can find additional recipes and product information about the Nielsen-Massey Pure Vanilla Extract and the other extracts that the company has to offer by visiting their site online. Disclosure: Shelly H. received a complimentary bottle of Pure Vanilla Extract to use in her review. No monetary compensation was received. Regardless, her thoughts, words and opinion are 100% her own. I use NielssenMassey products. I love the vanilla bean paste. I haven't quite made up my mind about the chocolate extract. I love the idea of placing a peppermint on the bottom of each mug of cocoa- so simple, but I had not thought of it. A while back I won a pint of stevia cocoa mint syrup by NuNaturals and boy was that good. I didn't even know they made that in a syrup but makes for a delicious mint coffee drink.